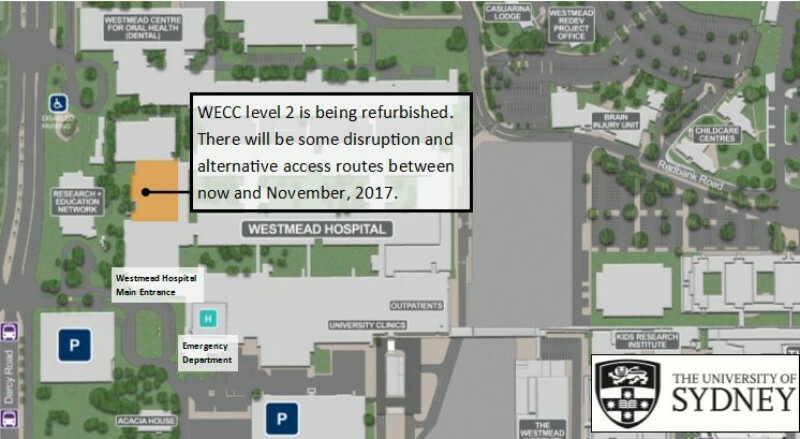 WECC level 2 is being refurbished. Level 2 of the Westmead Education and Conference Centre (WECC) is being upgraded by the University of Sydney as part of the Westmead Redevelopment refurbishment program. Works are occurring now and are expected to be completed by November 2017. The area near the WECC reception is closed. Access to the John Loewenthal Auditorium, lecture theatre 1 and tutorial rooms will be maintained. Please follow signage in the area as access routes may change. Upgrades to WECC level 2 include new ceilings, carpet, lighting and fire services. The refurbishment of WECC level 2 follows the recently completed refurbishment of WECC level 1. Work is also underway to refurbish Westmead Hospital Library. The transformation of education, training and research facilities at Westmead responds to our growing multidisciplinary environment, and aligns with our vision of a being a global health precinct.